Listen to the audio. Click/tap on the picture that matches the audio. If you are right the seedling is watered, grows, blooms and the flower is picked. Continue until you have collected 10 flowers. This game concentrates on your ability to recognize and understand spoken Italian. Topic audio is played which you must match to the correct picture. This will improve your ability to recongnize spoken Italian words, phrases and short sentences without the help of the written text. This is a vital skill in mastering basic Italian and being able to use it in real life situations ( like talking to Italian people in Italian !! ). Sow grow is a one player game to learn or revise spoken Italian. Sow grow is a timed game - play a few times, set a personal best time and try to get on the leaderboard! It is best to listen to the audio together with the written texts in the topic lesson before you attempt this game. 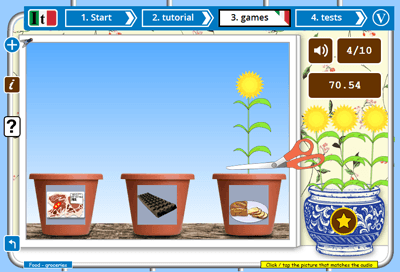 Select the Sow grow game from the games selection page. On the settings page there are brief instructions on how to play. The game is timed and the clock starts when you enter the play screen. The first seeds are planted and the first Italian audio is played. Click / tap on the speaker button at top right if you want to hear the audio repeated. Click / tap on the pot picture that matches the audio. If your answer is correct the seedling will grow into a flower which is then picked and put in the vase. If your answer is wrong, the audio will play again, the correct text will appear on the screen and an arrow will indicate the correct picture. Click the close button at top right to continue. You need to answer 10 questions correctly to complete the game. There are occasional "flower bonuses" available which will take 5 seconds off your time. A leaderboard records the 10 fastest times for each topic. Click the gold star on the vase to see the leaderboard. If you get one of the 10 fastest times, you are offered the chance to enter your name into the leaderboard, or you can cancel if you are not interested.